This book, entitled The Smaller British Birds, was published in 1874. 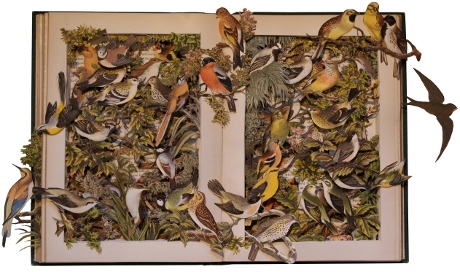 It’s one of my more intricate assemblages, with all the tiny detail of the birds and their surrounding foliage as they burst from the pages. The colours are rich and beautiful and appear to have survived the years with little or no degradation. Rather romantically, many of the books I work on reveal little bits of their past lives to me, in a number of different ways. As I cut into this one, the scent of wood smoke was released, an evocative reminder a bygone era and a glimpse of its history. Every book hides a whole world in itself, all we need to do is open and read it. 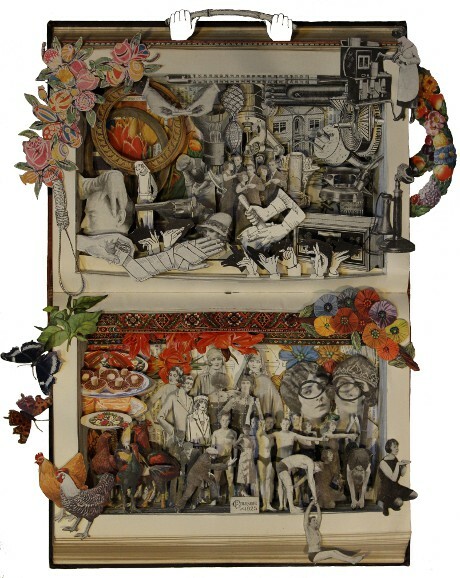 A book is the principal inspiration and the object of a wonderful craft of British artist Kerry Miller, who cuts to the core of imagination using some of the most basic tools, a pair of scissors, ink and watercolors. The artist scouts for very old, rejected books and saves them by transforming their essence into something new – visual reminders of their literary content and unique pieces of art. 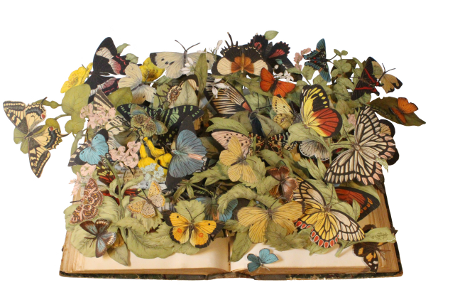 These delicately cut three dimensional collages are currently on display at the Shooting Gallery in San Francisco at an exhibition titled Reimagination of the Book. Opened on February 8, this wonderful show will be on view for a month. All of the books, or rather artworks, are made from reading material that would otherwise probably end up in a recycling bin. This way, they have been given a new life, which honors their previous one. 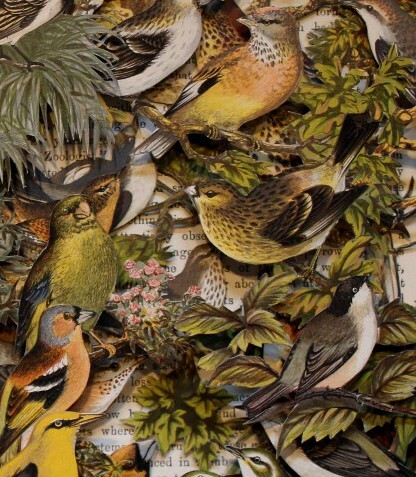 These beautiful collages are made exclusively with cut illustrations from each particular book, adding only a little color or ink in order to give profundity and vitality to the piece. 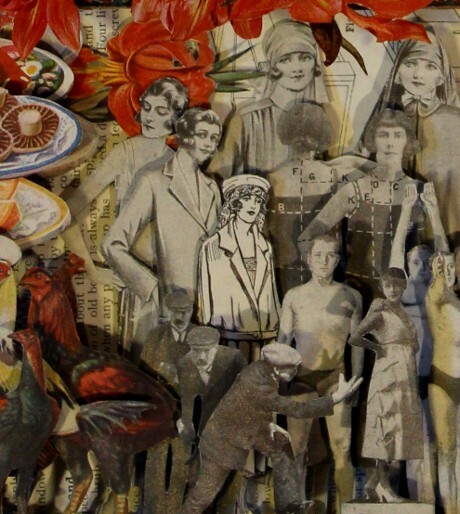 The final result of Kerry Miller’s dance with these stories is an impressive overflow of lovely old images, arranged in a singular bouquet of paper. Sometimes, the artist recreates the front cover instead of the pages, opening a window into the written content of the book, telling a story that appears almost theatrical set in a frame in this way. That is how A Handbook to the Order of Lepidoptera, Part 1 vol. 2 form 1896 becomes a bubbly butterfly nest, botany literature a flower bed and a zoology study – a window into the wildlife. There is something utterly delightful in Kerry Miller’s books, something that takes the viewer back to childhood and to the colored pop-up albums, or to grandmother’s garden, closet or kitchen. Releasing the images, Kerry Miller allows us to step into their world, separate and unique for each of the reinvented books, one more charming than the other, narrating what would otherwise be forgotten tales. One of the favorite pastimes of Kerry Miller is the book search. She picks each one of them carefully, paying a lot of attention to their illustrations and character, and envisioning the finished work. She thrives on recreating books that are deemed useless because of the level of damage or age. She perceives her work as a cooperative action, taking the book content seriously, regardless of its obsolete nature. 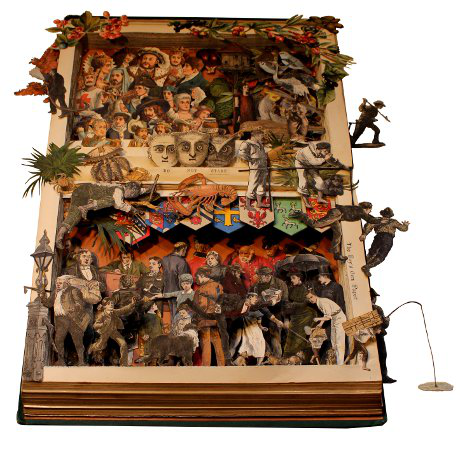 Kerry Miller performs her enchanting craft in Oxfordshire, UK and she is specialized in carving three-dimensional books after many years of creating in classic collage and mixed media. Escaping from the speed and technological oversaturation of our everyday, Kerry Miller states that this is the best possible time to reimagine the book. 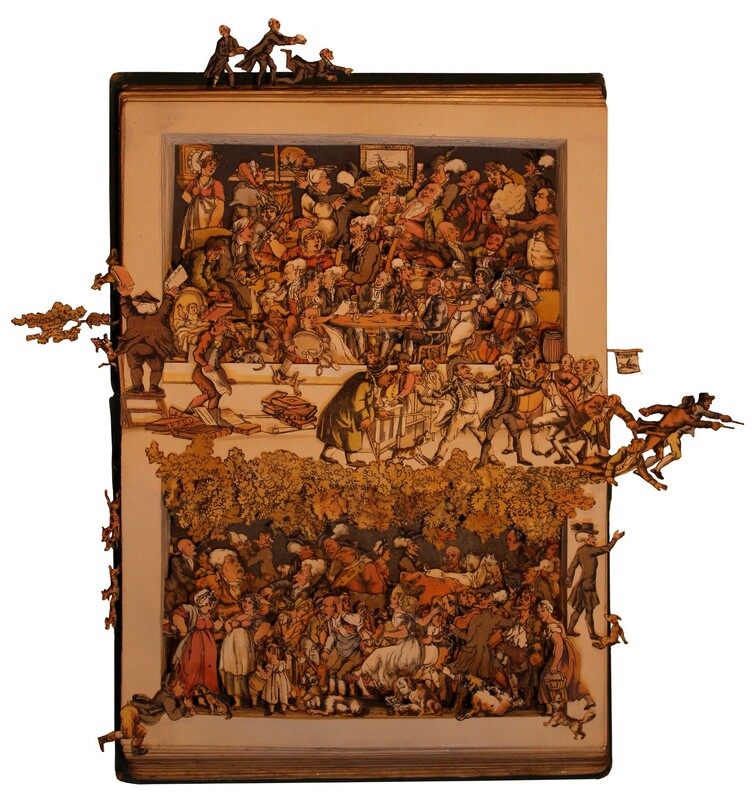 The display of Kerry Miller’s book wonderland will be open until March 8, 2014 at the Shooting street art gallery at San Francisco. My solo exhibition at the fabulous Shooting Gallery, San Francisco is starting tonight with the opening reception at 7pm. The gallery is at 886 Geary Street – it’s on for a month, so do check it out if you’re in the area! Harmsworth’s Household Encyclopedia was a practical guide to all home crafts in the 1920s, a cornucopia of diverse subjects as chickens, shadow puppets, dance steps and – somewhat bizarrely – handguns! Seeing a pair of lorgnettes (essentially spectacles on a stick) which were the fashion of the day, it’s hard to imagine anyone using them without looking more than a little imperious! These days we see media coverage on the debate over size zero models, but the images in this encyclopedia show that the fashions of the 1920s did not accommodate the slightest hint of a womanly curve!